Home » Pest Control » Mosquito Magnet traps mosquitoes and kills them ! Mosquito Magnet traps mosquitoes and kills them ! Petaling Jaya residents who go to Taman Jaya recreational park to exercise are faced with mosquito problem. To combat this problem, Bukit Gasing assemblyman Rajiv Rishyakaran has invested in a machine called the Mosquito Magnet which traps mosquitoes and kills them. Rajiv said this was an alternative method in combating the threat of dengue in his constituency and hopes that other town councils will also find alternative ways, other than the search and destroy efforts that are routinely carried out. He also added that this was the first of its kind in the state government to implement an alternative method like this. The machine works by turning liquified petroleum gas or liquid petroleum gas (LPG or LP gas) into carbon dioxide and heat, emulating a human's body temperature. The mosquito then gets attracted to it and flies into the machine where it is trapped and killed. 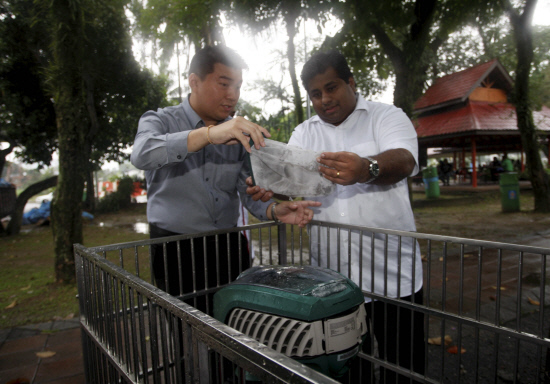 Rajiv said that there are currently two machines, one at Taman Jaya and the other at the Gasing Indah park. He also said that if it has the desired effect, they could very well implement the machine state-wide to fight the dengue epidemic. Rajiv also added that that if the dengue situation gets worse, he will consider getting more machines for Bukit Gasing. "We will move these two machines around to the dengue hotspot areas when the need arises," he said. The Mosquito Magnet costs RM4,800 and has already gotten steady demand from private companies, particularly in the hotel and food and beverage industry. Terima Kasih kerana membaca, Mosquito Magnet traps mosquitoes and kills them !